This is a product that I’ve been anxiously waiting for. 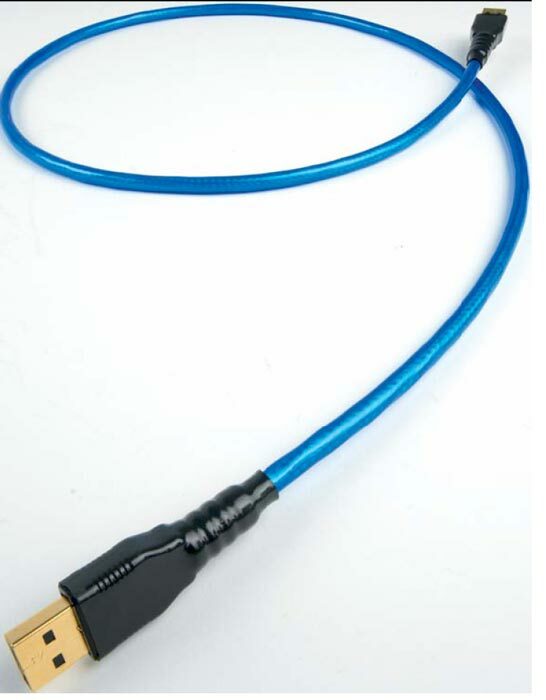 I first heard about the new Blue Heaven USB cable from Bjorn Bengtsson, Nordost’s International Sales Trainer when he was in NZ a few months ago. He reckons this cable makes a major difference to the sound of any USB component plugged into it, more so than messing around with codecs and even higher bitrate files in some cases. As the Nordost press release puts it: “…the standard for USB (Universal Serial Bus) 2.0 cables is rather more complex than the 75 and 110 Ohm digital leads we are more used to. Their hybrid construction combines data and power conductors with multiple screens in a precision symmetrical array. Any geometrical or impedance deviation will materially effect data-integrity, making it a challenge that tests the ability of cable manufacturers to produce and consistently terminate cables that meet the standard sufficiently accurately for high-fidelity audio production. the cables are entirely manufactured and terminated in the USA, allowing us to control every aspect of production. Yeah yeah yeah, I can hear it now – bits are bits are bits so the cable can make no possible difference right? Sure whatever. I’ve heard sonic differences in HDMI cables, so forgive me if I’m dead keen take a listen to one of these things. I’ve been knee deep in DACs for a while with more coming in soon, so the timing is good. I’ll hit up Tom at Orange Road Audio and see if I can get one along with a Moon 100D DAC. The Blue Heaven USB will be available in NZ in 2-3 weeks (so early December) with a RRP starting at $430 for the 1m length. Funny that file transfer (massively more bandwidth that streaming audio even 24/96) speeds are identical to standard USB cables. Notice how they make no claims that are testable/verifiable, imagine the marketing coup it would be vs other cable companies if they had actual results to prove there cables were better. 2)Has some form of jitter elimination (via asynchronous PLL etc) built in. Claims like “improved bass response” and “made the highs sparkle” are just fantasy and can’t be true with regards to a digital cable. So really what mechanism is left? I’m sure you’ll be thinking but I can hear a difference so that’s all that matters. I would direct you to this. And ask you if these differences were audible then why has nobody been able to differentiate in DBT conditions? I think you’d seriously be leading people astray recommending anything of this nature or even implying it is worth peoples money. Cables are an easy one for me – if you can’t hear (or see) a difference, then you just saved yourself some money to spend on music and movies or your AV components. I know about people being all too ready to hear what they expect to hear when it comes to hi-fi “upgrades” but DBT testing isn’t the be all and end all in this very subjective arena. I try to approach everything I review like a Tui billboard, as in “Yeah Right” for the benefit of our overseas readers. BTW – why not start some threads on the issues you’ve raised on our forums? I reckon there’s plenty to talk about here. I come across a lot of people who are quite prepared to call cable upgrades such as the Nordost Blue Heaven USB as just bull***t! Yet, I find they never do so by actually listening. It’s always done from an intellectualised and theoretical perspective. I suppose stooping so low as to defying theoretical bias and actually listening (without confirmation bias either way) is too confronting. Now, before anyone accuses me of “confirmation bias” and other psychological labels, bear in mind that I’ve spent some forty years in music composition, sound production and engineering. These days, I focus on acoustical design for recording studios and listening rooms. I also happen to be qualified as a hypnotherapist. So, I understand the power of “auto-suggestion” and “confirmation bias”. I’ve seen many hilarious examples of it in studios over the years. Very funny! There is also a lot of “auto-suggestion” used in marketing hype of audio gear, which annoys me no end! Now, I have not bought this cable, so I have no need to justify a purchase. I have one loan from a friend. I have no vested interest in test results. I don’t give a “rats” either way. If it’s good or BS, I’ll say so. I have just compared the Nordost Blue Heaven USB with two generic cheapo USB cables, using a XP-202 USB interface and a pair of cheap AKG K518DJ headphones with sound sources from a PC. Nothing very exotic (except the Nordost USB). Time and time again, I’ve swapped cables over, changed sockets, tried different music types, mp3’s to uncompressed 24-bit/96khz files. No, there were no tonal differences, which I didn’t expect anyway, but there is DEFINITELY a better focus using the Nordost. There is a phase coherency that places single microphone sounds, such as vocals, with more pinpoint accuracy, rather than the smeared approximation coming from the other cables. Transients, such as nylon tipped drum sticks on cymbals come through better defined and placed in the stereo spectrum. Bass guitars and kick drums are tighter, more true to the original sound files. These results are consistent across the board, using very cheap equipment at that (I’ll be trying it with a Naim Uniti and Stax Lambda’s next). There is no confirmation bias going on here. Like I say, I have no vested interest or a dire need to impress anyone. I do not profess to understand all the technicalities involved, or why this cable costs so much (perhaps that aspect is BS!). However, since I work with sound for a living I have to ultimately trust my ears (and brain). So, in defiance of all skeptics who cry “it’s impossible!! !” I will go on record to state that, in my tests, this cable produced a noticably better result than my two “regular” USB cables. There! Well Sandvik just because you are aware of confirmation bias doesn’t mean you are immune to it. http://www.bmedreport.com/archives/21216. Again you seem to think you can steel yourself against confirmation bias just by your experience/knowledge of it. this isn’t the case. I can’t explain why there are audible differences – maybe in the latest test it was a matter of shielding in a noisy electronic environment – but the differences are there and can be heard (yes, even blind). Your reference to an article about placebos and irritable bowel syndrome is interesting, but it’s just a variation of factors I’ve already known about for the last twenty-odd years. Yes, you are right, as a human being I am not “immune” to hypnotic suggestion, no one really is. Not even you! In fact most peaople are in a hypnotic trance about 50% of their waking reality, if you really want to analyse it! Yes, even you. However, as a qualified hypnotherapist, I have a better understanding of how these factors really work than the average person. These days, I spend literally every day performing acoustical analysis, design and sound engineering. So, I listen to things a lot, you might say. But, for you to even suggest that for all these decades I’ve merely been labouring under selective “self-hypnosis” when it comes to cables, is very funny and not at all convincing. So, what you are basically suggesting is that any old cable will do? Well, a long time ago I knew no better. After all, voltage is voltage, right? However, with practical experience learned that the better the equipment was, the more the end results suffered by using poor cables and plugs. Like I said, try it for yourself! Don’t just intellectualise and hypnotise yourself with these articles. Be brave! Challemge your own “programming”! Live a little!